Since launching the quite informal International RS Aero Speed Freaks challenge in May 2015 there has been some great interest, boosted further by the recent mild but very windy winter in the UK. With Sailor vs their GPSs the goal is a pure and level platform for remote competition Worldwide. Find an appropriate venue on a windy day and see what you can record. Take a photo of the readout with extra bonus points for a cheesy grin and a good account of your breezy exploits! Michael O’Brien started the ball rolling with a modest 12.4kn in Seattle USA last May. The USA kept their momentum up with Boston’s Eric Aker upping the stakes to 15.0kn. Paul Harwood manage to equal Eric’s speed on his wind swept Exmoor lake of Wimbleball before, back on the USA’s West Coast, Portland’s Sean Grealish set 16.2kn during a training run at the Columbia River Gorge whilst preparing for the 2015 North American Champs there. Following the coaching day at the RS Aero North American Championships on July 24th there was a late afternoon GPS Challenge (report HERE). Three GPS units were swapped between the RS Aeros and each competitor had 10 minutes to blast about in turn in search of a top speed with a Velocitec Speed Puck. The wind was dropping towards the end of the day and speeds were limited. There were gusts to be had and 16 year old Sean Grealish achieved 14.4kn in the conditions available with a 9 rig. Top RS Aero 7 was Jim Muir of Santa Barbara, California with an impressive 13.8kn. Just two weeks later the record came to the UK when Andy Butler, from Combs, Northern England, smashed out a 16.8kn whilst visiting Salcombe in the summer. It then took another 3 months before an increase when Gareth Griffiths at one of London’s raised reservoirs, Island Barn, hit a 17.7kn - during a race! With the level now high there followed many personal bests that fell short of the record. 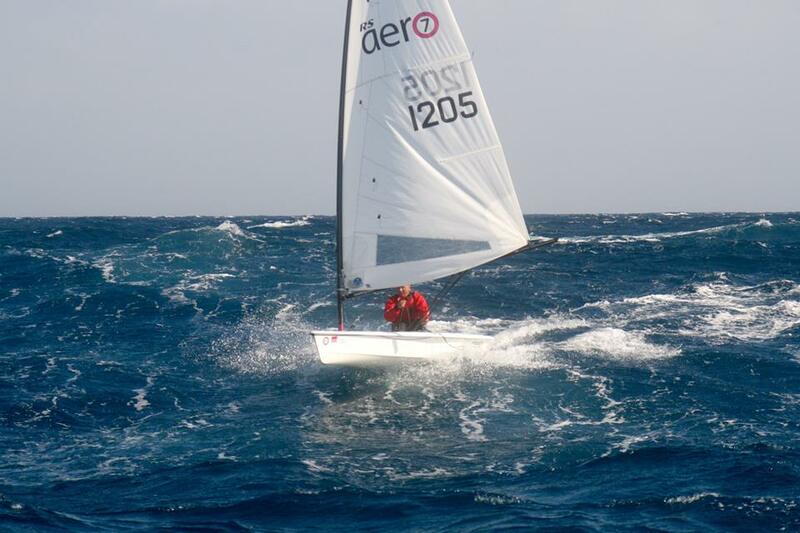 Ants Haavel from Estonia recorded 16.8kn on the eastern Baltic during a late end of season Christmas sail. Peter Barton raised his best speed from 15.8kn to 17.5kn in the Lymington River. 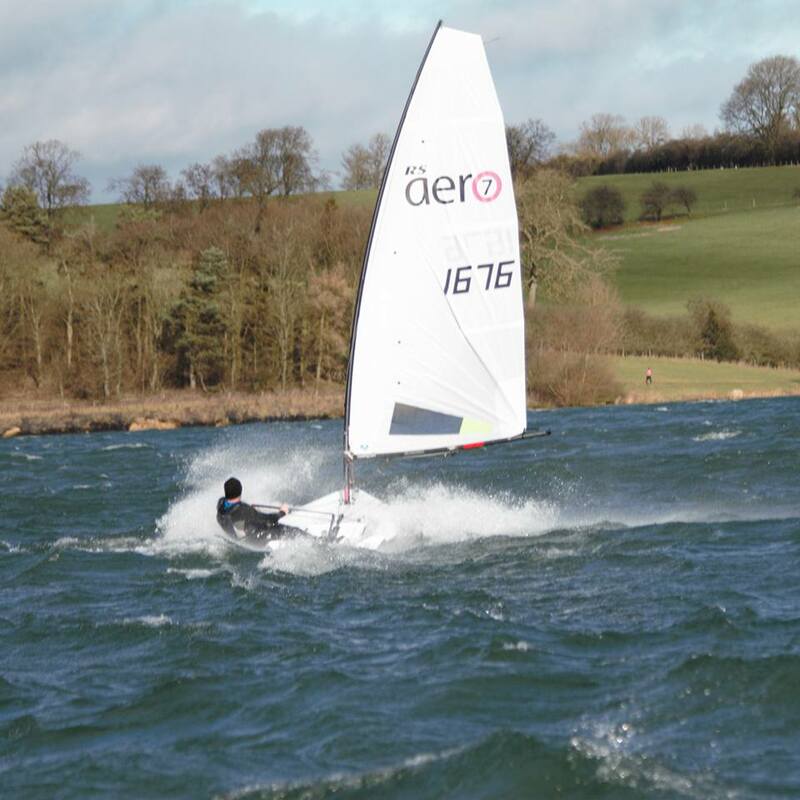 Then came Anthony ‘Chunky’ York sailing on the UK’s Inland lake of Northampton. Having opened his account with a 16.2kn he narrowly pipped Gareth’s record with a special 17.8kn Valentines day offering. However, it was only one week later in February 2016 when Chunky absolutely smashed his own record. With the Club anemometer peaking at 37kn (but a little sheltered apparently) and heinously gusty, Chunky let rip down the lake on just three downwind angles. The first reach was failed, with his legs angled the boat bounced and as the acceleration kicked our ninja warrior was jettisoned off the back, hitting the water at speed. The second reach was the big one with a max speed of 23.9kn (27.5mph) at 28-30 seconds on the vid HERE. The third reach gave an incredibly high average with 18.2kn (21mph) averaged for a whole 1minute 15 seconds - which is faster than the 2nd best peak speed! Just when the ink was nearly dry on this summary, on a day when racing was cancelled on the coast, Emily Davis set sail at Great Moor in Middle England. Unusually she rigged her ‘7’ up, rather than her normal '5', so that she could match her brother in his new boat. Sporting her new onboard camera with built in GPS she thought little of her 13.9kn - but that does in fact make her The Fastest Lady on the Planet, edging out Catherine Gloster of California's 11.4kn from the Gorge last summer! Chunky’s 7 rig record is going to be hard to improve on. Niagara falls may be one of the best venues to try to beat that! However there remains plenty of scope for improvement in the 9 and 5 rig speeds with a debate ongoing as to which might be the best rig for a fastest ultimate speed. Hopefully someone will be able to join Chunky in his exclusive 20+kn club though, before he becomes too lonely! Full accounts of the Speed Freaks recordings can be found HERE.